« Del Monte Pineapple, Udi’s and More Printable Coupons! I hope you’ll try it Christine. Thanks for stopping by Lindsay! Your blueberry almond ice cream looks awesome! Thanks for hosting again Lark! Oooh I love squash! I make it with zucchini and parmesan cheese, mmm! This looks great though, I’ll have to try it! Found you at the Thursday Blog Hop and am glad I did! Am a happy new follower :). I added cheese in our pre-allergy days. Thanks for joining us, Marlee! What a great recipe! Thank you for a great recipe idea. As someone with food sensitivities to yeast and cane sugar, it’s encouraging to find others who are getting creative with various food options. Have a great day! Hmmm that looks yummy. It’s hard to find yellow squash here in Australia often, next summer I might try and grow it myself and try your recipe! We just got a large basket of squash from the garden yesterday and this will be a great dish to try. Thank you so much for sharing with Full Plate Thursday, have a great week end and come back soon! Thanks Miz Helen! I hope you enjoy your squash! i never tried summer squash yet, i don’t even knew it but i asks mr. google already and found out that its like a yellow zucchini, which i just saw in the market today. so, thanks for sharing your recipe, sounds easy and i think we can give it a try! have a great weekend! 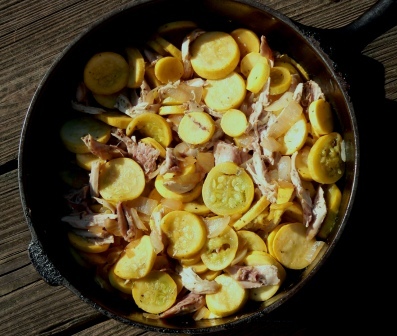 That squash and chicken skillet sounds so good. What a perfect way to use up the bounty of your garden. Thanks for sharing your recipe at These Chicks Cooked Recipe Spotlight. Have a great weekend! Recipe looks very easy and healthy too! Great for using up those chicken leftovers in the fridge. 🙂 I sure would agree that some kids may have a hard time with the squash, but starting to have them get used to it earlier would be nice. Thanks for stopping by Mars! never eaten anything like that, but looks yummy! hope you don’t mind, i will be adding your blog into my blogroll.. and hope you could visit me back! This is my kind of meal: real food, simple and delicious! I will give this a try as soon as I harvest my summer squash. Thanks for sharing this recipe with the Hearth and Soul Hop. Thanks Alea! I hope your harvest is abundant. That looks so easy and so yummy. Thanks for sharing this recipe!